Usually the statement goes, what is to good to be true, typically is, so it would make sense that most investors first experience with Bitcoin or any other crypto currency would be with a High Yield Investment Program. They are typically structured in a multi-level platform, which allows for referral codes, down lines and commissions for promoting them which produces way more exposure. This is true with myself, as one of my friends was a marketing something called Bitcoins Brain. I watched him for a few days, unloaded around 35 dollars after fees and with in 3 days that money was gone. I had only recouped about 3 dollars of my original .01 BTC. This did not settle well with me so I set off to learn all that I could about crypto currencies, eventually landing on something called a faucet. What is a faucet? How could they work? A Bitcoin faucet works just like an actual faucet in your home, flowing free fractions of BTC to its users. Unlike a HYIP, which nearly always requires a non-refundable deposit, there is no need to deposit anything. The only real requirement is that you have a wallet address, for that I recommend Coinbase, Faucet Hub or Coinmama. Once you have a wallet address, you drop that into a box on the faucet page and fill out a captcha puzzle. The faucet manager will set how much you can claim, how often and when the payouts will be. From my experience, I claim around 100 Satoshi per faucet. There is no limit on how many you can use. A Satoshi is the smallest unit of currency associated with Bitcoin. It measures 0.00000001 BTC. All transactions that occur on the block chain are recorded in Satoshi prior to being converted to BTC. At the time of this writing, a US penny = 0.00000385 BTC or 385 Satoshi. Faucets provide a few great services. 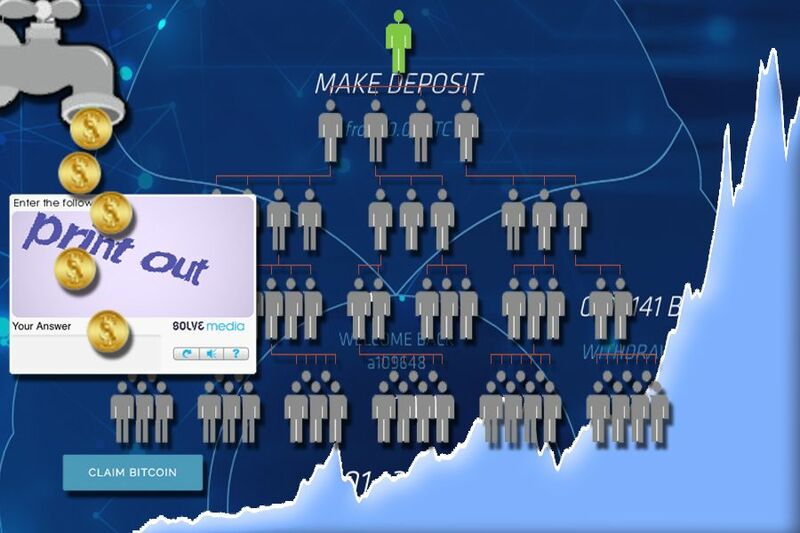 First off, they allow users new to the crypto currency world an opportunity to play around and not risk any money. Second, they allow faucet managers the ability to market their site with more traffic, since they are giving away free money. Third, they allow companies to advertise their products to a new market via captcha media partners. With faucets, it is all about risk and reward, while you will not get rich off playing the faucet rotator game, you will produce Satoshi, which become BTC, which at the time of this was hovering right around 2600. Welcome to Steemit! I wish you a good day and inspiration to create in our community! Please follow me :) and upvote all my post and i do the same. Our faucet pays between 1000 and 2000 satoshi per submit. That's great! I'll be sure to check it out!